Description: This herbaceous perennial wildflower is ¾–1½' tall and unbranched. It consists of a central stem with 3 terminal leaves; a mature plant will produce a single stalked flower. The central stem is terete, glabrous, and pale green or pale reddish-green. The terminal leaves are arranged in a whorl at the apex of this stem. Each leaf is up to 6" long and 5" across; it is oval-ovate or oval in shape, medium green, and glabrous. Each leaf has smooth margins and parallel primary veins. The single flower spans about 3-4" across on a stalk about 1-3" long. This stalk is ascending or erect; the flower is held above the leaves and usually leans to the side (but doesn't droop downward). Each flower consists of 3 white petals, 3 green sepals, a central white ovary, 6 stamens, and 3 stigmas. The petals are ovate-obovate, widely spreading, and usually longer than the sepals; they often become light pink with age. The sepals are lanceolate and widely spreading. The dull yellow stigmas are slender and either straight or slightly recurved. The blooming period occurs from mid- to late spring and lasts about 3 weeks. Each flower is replaced by a 6-angled seed capsule that becomes dark with age; it eventually splits open to release the seeds. The root system consists of a vertical rootstock with fibrous roots; spreading rhizomes are also produced. Occasionally, this wildflower forms loose colonies of variable size. Cultivation: Dappled sunlight or light shade is preferred during the spring; later in the year, more shade is tolerated. The soil should be rich, loamy, rather loose, and evenly moist; a surface layer of leaves and other decaying organic material is desirable. This wildflower develops very slowly from seed (several years to maturity). It is also possible to propagate this species from vegetative offsets of the rhizomes, but this takes time to develop as well. Range & Habitat: The native Large-Flowered Trillium is occasional in NE Illinois, while in other areas of the state it is uncommon or absent. Populations of this species are stagnant or declining in Illinois; it is somewhat more common further to the east and northeast of the state. Habitats include rich deciduous woodlands, swamps, and shaded riverbanks. 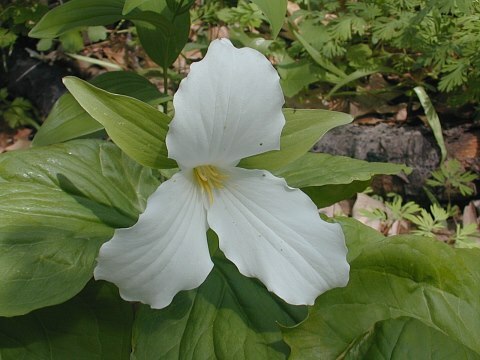 Occasionally, Large-Flowered Trillium is cultivated in shade gardens, but it is expensive and difficult to obtain; wild-collected plants should be avoided. Faunal Associations: As showy as they are, the flowers are rarely visited by insects; Graenicher observed a single species, Ceratina dupla (Little Carpenter Bee), sucking nectar and collecting pollen from them. Another small bee, Andrena geranii, was observed to seek shelter in a flower from the rain. The caterpillars of two moths, Euplexia benesimilis (American Angle Shades) and Clepsis melaleucana (Black-Patched Clepsis), occasionally feed on Trillium spp. (trilliums); the latter species is polyphagous. The seeds of this and other trilliums are distributed by ants because of their elaisomes (food appendages). White-Tailed Deer readily browse on the foliage and flowers of trilliums, and they appear to be attracted to Large-Flowered Trillium in particular (possibly because they can easily see the flowers). 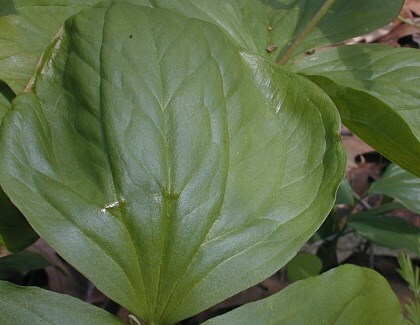 Where this trillium is abundant, its large leaves can provide significant cover for small mammals. Photographic Location: A deciduous woodland in Piatt County, Illinois. Comments: Among the various species of trilliums, this one is probably the most attractive and charismatic. The flowers are very showy and the leaves have a nice glossy surface. The only other species that is similar, Trillium flexipes (White Trillium), has flowers that are a little smaller and more nodding; usually its flowers hang a little above or a little below the leaves. Large-Flowered Trillium has slender stigmas that are straight or slightly recurved, while White Trillium has stout stigmas that are strongly recurved. While there are other white-petaled trilliums in Illinois, their flowers are much smaller in size (2" across or less).